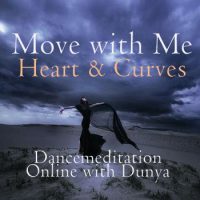 View Cart "Move with Me: Curves & Heart ~ Dunya Online" was successfully added to your cart. Move with Me: Basic Practices is back! The human journey of self-knowledge requires awareness of our body. We move in this rich doorway to come home to our eternal, unmoving Self. We find solace, perception, attunement, and joy. By popular demand, I am re-issuing the first Move with Me course of Basic Practices from 2013. Here is self-comfort to do in your own space, on your own time. Slip out of your harassed mind, into your intelligent flesh, and smooth into one whole person again. Included is a downloadable PDF containing session summaries, music titles, excerpts from selected anatomy, Sufism, spiritual, & art texts, a reading list of highly recommended titles, community connection through our hosting blog page, and a weekly food tip. 2. 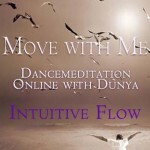 The course is hosted at Dancemeditation.org on a password-protected page. You will receive an email with a link and a password. 3. You can do the sessions as many times as you wish and at any time you wish. Dancemeditation™ is a program of the Dervish Society of America (DSA), a nonprofit registered 501-C3 organization dedicated to the path of evolutionary Sufism. DSA provides opportunities for personal development, exploratory inquiry into embodied spirituality, and community connection through practice, service, and performance. Donations are tax-deductible. Your nonrefundable payment for this course benefits the Dervish Society of America, a nonprofit 501-C3 tax-exempt organization supporting the activities of Dancemeditation™. Your payment is tax deductible. Thank you!